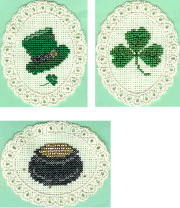 Three designs are about Irish folklore and St. Patrick’s Day. The images use satin, embroidery and metallic floss which give different effects. The shamrock may say “Luck O’ the Irish”. A top hat shows a shamrock ready to be inserted in the hatband. The gold beads represent gold nuggets on gold metallic thread in the magical ‘pot’. The images fit on pre-finished ovals.